"You might belong in Gryffindor, where dwell the brave at heart, their daring, nerve, and chivalry set Gryffindors apart;" Completely all natural, this glitter bath bomb measures 2.2" in diameter, and uses 100% biodegradable glitter, so it's completely eco-friendly. 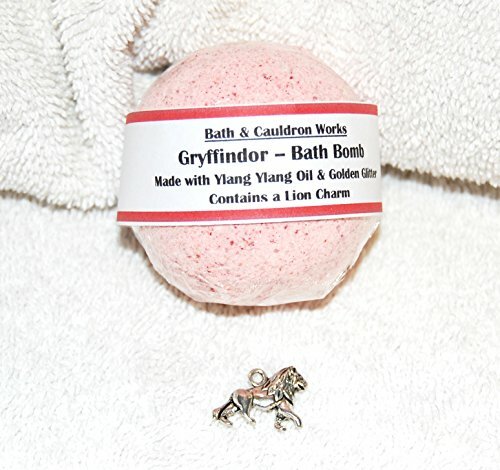 This Gryffindor bath bomb features ylang ylang oil and biodegradable gold glitter, as well as a silver lion charm! Each of our bath bombs is hand-made, and will vary slightly. Andromeda House exclusive! Free shipping applies to domestic US orders only! If you have any questions about this product by Andromeda House, contact us by completing and submitting the form below. If you are looking for a specif part number, please include it with your message. The Honest Elephant Deluxe Soothing & Relaxing Lavender Essential Oil Bath Salt Mineral Soak with Organic Lavender Flowers in 16oz Vintage Glass Milk Bottle | Organic Lavender | FREE SHIPPING!